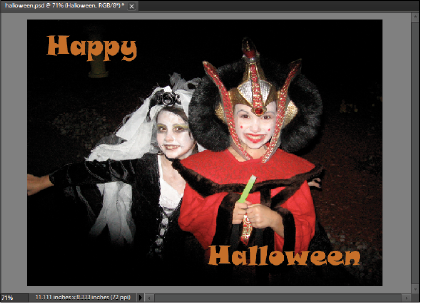 This tutorial provides you with a foundation for working with Adobe Photoshop Elements effects. It is the seventh lesson in the Adobe Photoshop Elements 10 Digital Classroom book. Now that the text is placed on the book cover, you can apply a Layer Style effect to the text. The first thing you will notice is that when you apply a layer style, the text does not need to be simplified. This means that you can still edit the text after you apply a layer style. 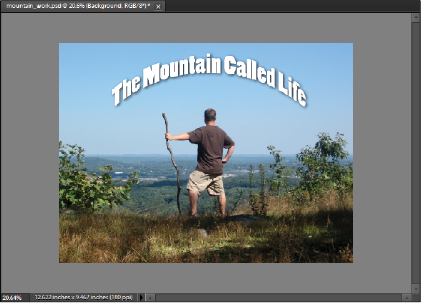 1 Make sure the layer called The Mountain Called Life is still selected. 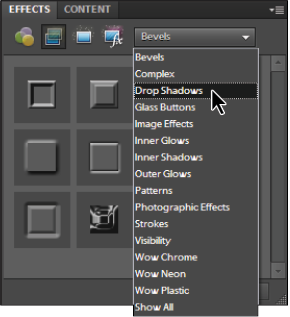 In the Effects panel, press the Layer Styles button ( ), the second button from the left. 2 From the drop-down menu in the upper-right corner of the Effects panel, choose Drop Shadows. 3 Double-click the Soft Edge Drop Shadow effect to apply that effect to the selected type layer. Remember, hover your cursor over the icons, and text balloons will pop up with the name of the Layer Style. Notice that you didn’t have to simplify the layer to apply this kind of effect. 4 Choose File > Save, then File > Close to close the document. If you want the names of the different effects to appear in the Effects panel with the icons, press the Effects panel menu button ( ) in the upper-right corner of the Effects panel. In the resulting menu, choose the option Show Names. This is what the final photo book cover should look like. In this exercise, you will learn how to save an animated gif that you could send someone as an e-card. You will create a file with two layers that you will then animate inside the Save for Web feature. 1 In the Organizer, locate and select the halloween.psd file. Press the arrow to the right of the Fix tab and choose Full Photo Edit from the drop-down menu to open the file in the Editor. 2 In order to save this file as an animated gif, you will need to change the file size, as it is currently far too big to use for the Web. Choose Image > Resize > Image Size. 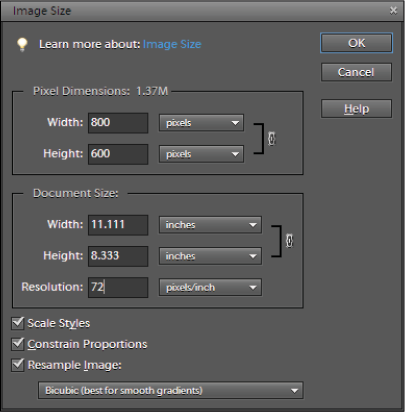 Make sure Constrain Proportions and Resample Image are checked at the bottom of the dialog box. First, change the resolution to 72, and then change the width in the pixel dimensions section to 800 pixels. Seventy-two pixels per inch is the proper resolution for the Web, and when you change the width, the height will automatically update because Constrain Proportions is checked. Press OK. Choose View >Actual Pixels to zoom in on the image. You may need to maximize the window to see the entire image by choosing View > Fit to screen. 3 Select the Horizontal Type tool ( ), and click in the top left area of the image. Type Happy. 4 Highlight the type and change the font to Snap ITC or any other font of your choice if you do not have this font available on your computer. 5 Change the size to 60. 6 Align the text to the left. 7 Click the color box in the Options bar to make your own color. Choose R:193, G:111, B:14. Press OK.
8 Use the Move tool ( ) to position the text in the top left corner of the image. With the Type tool still active, you can move type by holding down the Control key and dragging, or by positioning the cursor just outside the text frame and dragging. 9 Choose the Horizontal Type tool again, click in the lower-right of the image, and type Halloween. 10 Position the text in the lower-right corner of the frame. The image with two different text layers. Now that you have the two text layers created, you will apply an effect to the text’s stroke. 1 Select the Happy layer in the Layers panel. 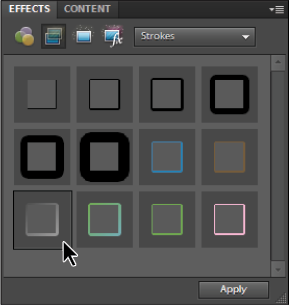 2 In the Effects panel, make sure Layer Styles are active, and choose Strokes from the drop-down menu. 3 Double-click on the Gradient Stroke Black & Gray effect. 4 Now choose the Halloween layer, and double-click on the Gradient Stroke Black & Gray effect. Select the Gradient Stroke Black & Gray effect.